"In 1987, Pub Med Central reported another public school measles outbreak among a 98% MMR vaccinated population. This happened in another high school, this one in Massachusetts early in 1984. Another population with over 90% vaccinated again... University of Helsinki Department of Public Health reported an "explosive outbreak" of measles in a rural community during 1989. Most of the infected had been vaccinated with the MMR vaccine. Those vaccinated who became infected anyway also managed to spread the measles to their siblings..."
"...there was a very large mumps outbreak among teens and preteens, during early 2010 in the New York/New Jersey area. Almost 80% of them had their MMRs..."
- In Germany, compulsory mass vaccination against diphtheria commenced in 1940 and by 1945 diphtheria cases were up from 40,000 to 250,000. - In the UK between 1970 and 1990, over 200,000 cases of whooping cough occurred in fully vaccinated children. - In the 1970's a tuberculosis vaccine trial in India involving 260,000 people revealed that more cases of TB occurred in the vaccinated than the unvaccinated. - In 1979, Sweden abandoned the whooping cough vaccine due to its ineffectiveness. Out of 5,140 cases in 1978, it was found that 84% had been vaccinated three times! - In the USA, the cost of a single DPT shot had risen from 11 cents in 1982 to $11.40 in 1987. The manufacturers of the vaccine were putting aside $8 per shot to cover legal costs and damages they were paying out to parents of brain damaged children and children who died after vaccination. "Q: Are some vaccines more dangerous than others? A: Yes. That’s exactly what I’m saying. This is a history that has been cooked up to convince people that vaccines are invariably safe and effective." 2. Vaccines contain extremely toxic ingredients that are poisonous to human health. Here is a partial list of vaccine ingredients. Which of these do you think would benefit you or your child's health? 3. Vaccines contain DNA from other species including monkeys, pigs, cows, and chickens, and they also contain DNA from dead human beings. When "alien" DNA is injected into the human bloodstream, it disrupts, undermines, and alters the neurological and genetic integrity of that human being. Ratajczak reports that about the same time vaccine makers took most thimerosal out of most vaccines (with the exception of flu shots which still widely contain thimerosal), they began making some vaccines using human tissue. Ratajczak says human tissue is currently used in 23 vaccines. She discusses the increase in autism incidences corresponding with the introduction of human DNA to MMR vaccine, and suggests the two could be linked. Ratajczak also says an additional increased spike in autism occurred in 1995 when chicken pox vaccine was grown in human fetal tissue. "Q: Now, you worked in labs. Where purity was an issue. A: How do you think I felt? Remember, this material is going into the bloodstream without passing through some of the ordinary immune defenses." We already know that genetically modified foods are causing deformities in human placentas and umbilical cords. We also know that genetically modified foods are causing miscarriages, infertility, birth defects, and severe illness in human and animals. What most people do not know is that Monsanto, the leading manufacturer of genetically modified seeds and foods, is owned by Pfizer, one of the leading manufacturers of vaccines, and that U.S. President Obama just appointed the Vice President of Monsanto as chief advisor to the commission at the FDA. Are you beginning to see the insidious workings of this diabolical cartel? "Two major changes happened in the 1990s in the US, making American children born since then extremely vulnerable: One, the FDA permitted, with no safety review, the introduction of genetically modified (GMO) foods – including soy and corn, which both go into infant formulas and most processed foods. Two, we upped the vaccine schedule dramatically for infants and children. Both have shown potential to injure the human immune system, brain, gut or other organs‘ development and function, from birth onward. We’re just beginning to understand how detrimental this is for triggering asthma, allergies, inflammation, seizure disorders, autism, or gut/brain injuries that may mean poor outcomes like Crohn’s disease, eosinophilic esophagitis, learning disabilities and conduct disorders – all of which have risen dramatically in children since 1990. Synergistic effects of GMO foods in pregnancy, in utero, in infancy – plus all the vaccines now recommended – are entirely unknown. For example: The gene inserted into GMO soy makes soy produce its own insecticide. It was found in gut bacteria of human volunteers eating GMO soy – meaning, the gene transcribed to the bacteria in the gut, and “taught” the volunteers’ gut bacteria to make insecticide. I believe this may be why some children with autism and GI problems are so treatment resistant, when it comes to correcting their bowel microflora. Do they have genes operating in there that make antibiotics and probiotics less effective? Nobody knows." If GMO foods can wreak this much havoc in humans and other life forms, can you imagine what genetically modified organisms will do when injected straight into the human bloodstream? "Why have the pharmaceutical and biotechnology industries chosen to experiment with the first ever, large scale application of a new, unproven, genetically modified, inter-species gene mixing vaccine technology on the female youth of an entire generation? The current deaths and maiming of young girls used as guinea pigs to test this new technology may be just the beginning. No one can predict what adverse consequences this newest inter-species gene mixing technology may cause. Remember we are dealing with the reproductive systems of an entire generation of young woman. Recombinant DNA, genetically engineered proteins, inter-species gene mixing, questionable new vaccine technology, lack of long term safety and efficacy data, questionable pre-qualifications procedures and now, an extremely high prevalence of reported adverse side effects up to and including miscarriage and death. This vaccine represents more than just bottom line profit for Merck. This is the first genetically modified drug unleashed across a broad swath of unsuspecting, formerly healthy Americans. Unfortunately, the target they chose for this grand genetic experiment is the entire female population of mothers to be for all future generations. Can we really afford to allow this fraud and deception to continue?" 5. Vaccines are damaging human health and disrupting the neurological integrity of human beings, especially children. "Among more than 9,000 boys age 4-17, the survey found vaccinated boys were two and a half times (155%) more likely to have neurological disorders compared to their unvaccinated peers. Vaccinated boys were 224% more likely to have Attention Deficit Hyperactivity Disorder (ADHD), and 61% more likely to have autism. For older vaccinated boys in the 11-17 age bracket, the results were even more pronounced. Vaccinated boys were 158% more likely to have a neurological disorder, 317% more likely to have ADHD, and 112% more likely to have autism. Complete survey results are available at http://www.GenerationRescue.org." "Both H1N1 and seasonal flu shots have been linked with a number of different side-effects across the globe, including Guillain-Barré Syndrome as well as dystonia, a paralyzing neurological disorder. The seasonal flu vaccine has also been linked with convulsions and fits in under-5′s." "The four children, from under six months to 2 years old, died between March 2 and March 4. The deaths occurred the same day to three days after the vaccines were administered, the ministry said." "A measles vaccination program in India was halted after four children died almost immediately after receiving the shot. “Four children died within minutes of receiving a vaccine for measles followed by drops of Vitamin A solution on Saturday,” reports MedGuru. Health professionals and doctors with government ties were also blamed in Finland and Sweden after a H1N1 vaccination program was halted following a 300 per cent increase in cases of the neurological disorder narcolepsy amongst children and young people who had received the shot over the last six months. Meanwhile, concerned mothers whose daughters have been injured or killed by the Gardasil vaccine have put together a website that documents the truth about how the vaccine has killed and injured thousands of young girls since it was introduced in 2006. Thousands of teenagers have suffered adverse reactions and at least 71 have died from the vaccine since the HPV program was launched four years ago." "In a 2008 trial for a bird flu vaccine, three Polish doctors and six nurses faced criminal charges after the vaccine killed 21 homeless people who were participating in the test. "The Indian Council of Medical Research (ICMR) has told Andhra Pradesh and Gujarat to immediately suspend the cervical cancer control vaccination programme for girls. The programme is part of a two-year study to look into the utility of a vaccine in public health programmes and acceptability of Gardasil, the human papillomavirus (HPV) vaccine made by Merck. Gardasil, available in medical stores across the country, is marketed in India by MSD Pharmaceuticals Pvt Ltd. The programme was marred by controversy after four deaths and complications among 120 girls were reported after vaccination. The girls complained of stomach disorders, epilepsy, headaches and early menarche. Women activists fear the vaccine may impact the mental health of girls who have shown no signs of distress so far." 7. Vaccines are part of a eugenics-based, globalist agenda to sterilize and ultimately eliminate 90% of the world's human population so that only those who have the "right" genes will end up surviving. "Q: If vaccines actually do harm, why are they given? A: First of all, there is no “if.” They do harm. It becomes a more difficult question to decide whether they do harm in those people who seem to show no harm. Then you are dealing with the kind of research which should be done, but isn’t. Researchers should be probing to discover a kind of map, or flow chart, which shows exactly what vaccines do in the body from the moment they enter. This research has not been done. As to why they are given, we could sit here for two days and discuss all the reasons. As you’ve said many times, at different layers of the system people have their motives. Money, fear of losing a job, the desire to win brownie points, prestige, awards, promotion, misguided idealism, unthinking habit, and so on. But, at the highest levels of the medical cartel, vaccines are a top priority because they cause a weakening of the immune system. I know that may be hard to accept, but it’s true. The medical cartel, at the highest level, is not out to help people, it is out to harm them, to weaken them. To kill them. At one point in my career, I had a long conversation with a man who occupied a high government position in an African nation. He told me that he was well aware of this. He told me that WHO is a front for these depopulation interests. There is an underground, shall we say, in Africa, made up of various officials who are earnestly trying to change the lot of the poor. This network of people knows what is going on. They know that vaccines have been used, and are being used, to destroy their countries, to make them ripe for takeover by globalist powers. I have had the opportunity to speak with several of these people from this network." "Given the routinely stated goal on behalf of mega-rich foundations that fund vaccination programs around the world, such as the Bill and Melinda Gates Foundation and the Rockefeller Foundation, to use vaccines as a way of sterilizing the planet’s population as part of the global eugenics soft-kill assault on humanity, it’s unsurprising that as more people become aware of this agenda, take-up rates of new as well as seasonal vaccines continue to decline. Quite how an improvement in health care and vaccines that supposedly save lives would lead to a lowering in global population is an oxymoron, unless Gates was referring to vaccines that sterilize people, which is precisely the same method advocated in White House science advisor John P. Holdren’s 1977 textbook Ecoscience, which calls for a dictatorial “planetary regime” to enforce draconian measures of population reduction via all manner of oppressive techniques, including sterilization." PLEASE PROTECT YOUR CHILDREN!!! 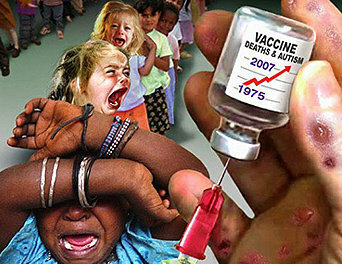 DO NOT ALLOW THEM TO RECEIVE VACCINATIONS!